MyBrowser looks like a decent web browser that you can use every day without any worries. However, our security experts say that this browser is a potentially unwanted program that might be associated with potential computer security issues. If you happen to have MyBrowser on your computer, you will do yourself a favor if you remove this browser from your computer right away. There is a good chance that you installed more unwanted programs on your PC along with this one, so here is your chance to terminate them all in a go. Should you need any assistance with software removal, you can always leave us a comment below. We have encountered similar programs before, and we know exactly where MyBrowser comes from. This freeware application is a direct clone of CrossBrowser and other similar programs. It is based on the Chromium engine, and that is why the program looks very much like the Google Chrome web browser. That is why some users are bound to trust this application and use it often. However, when you do not remember installing this application, and it is still there on your computer, it should be enough to convince you that you have to get rid of it. How does MyBrowser manage to enter target computers? After all, this application does not have an official homepage that would offer the direct download function. So the answer is simple: bundled downloads. The program is distributed in software packages with other unreliable applications when you download something from a file-sharing websites. As mentioned above, you must have installed MyBrowser with several other applications that you could definitely live without. There is a good chance that you did not even notice how this program entered your computer. Therefore, it is important that you stay attentive during freeware installation processes. You can often choose to avoid installing additional programs if you read all the setup steps carefully. Perhaps you will realize that there is something fishy about MyBrowser when you get redirected to the Plus! Network. This domain is used by a number of potentially unwanted programs for third-party content promotion. It also displays commercial ads on the main page, offering you to download free white paper to for “Achieving USB connectivity w/ Mixed USB SoIns.” Take note that the type of advertisements may differ based on your web browsing habits. MyBrowser and other freeware applications monitor your web browsing activity to provide you with the most relevant advertisements. They need you to click those ads so that the programs could make money via the pay-per-click system. There is nothing illegal about it, but such applications like MyBrowser seldom check the reliability of the third-party content. Thus, if you click an ad that redirects you to a third-party website, you are entirely on your own. Needless to say, this presents particular security risks you should not take. Cyber criminals might exploit MyBrowser to promote their content, and eventually that could result in a malware infection. Therefore, you should avoid that by removing MyBrowser today. If you do not know what other unwanted programs are installed on your PC, scan the system with the SpyHunter free scanner. You will find out which applications must be deleted from your PC, and it will be a lot easier to secure your system. Press the Windows key + R and hold them. The Run command box will open. Type “control” into the box and press Enter. Open Uninstall a program and remove MyBrowser. Go to Uninstall a program and remove MyBrowser. 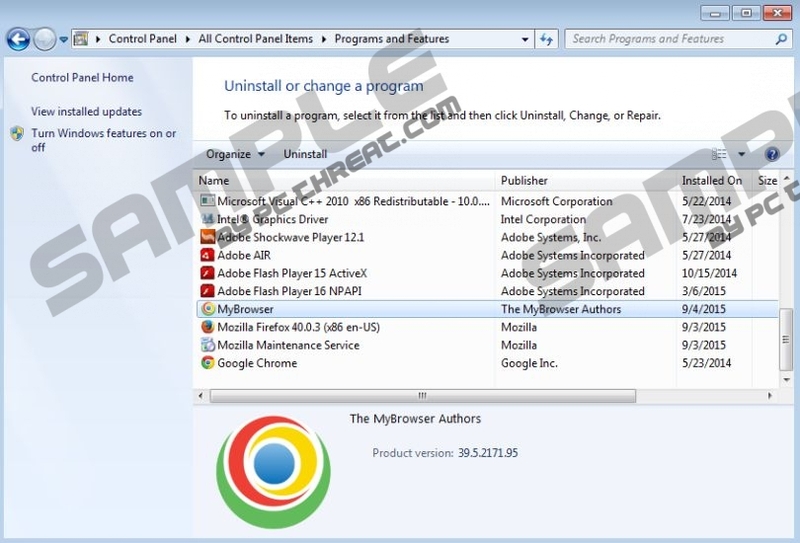 Select Add or remove programs and uninstall MyBrowser. Quick & tested solution for MyBrowser removal.